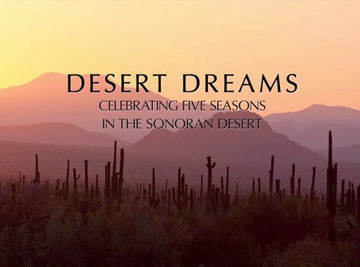 Eight, Arizona PBS offers a special presentation, “Desert Dreams: Celebrating Five Seasons in the Sonoran Desert,” debuting Dec. 4 at 7 p.m. on local Channel 8. The program showcases 182 species of plants and animals in a first-of-its-kind presentation of the Sonoran Desert as it changes over the course of a full year. “Desert Dreams” blends HD video footage and time-lapse imagery captured over the past four years with stills from the filmmaker’s photographic archive compiled over three decades to chronicle five seasons: Dry Summer, Wet Summer, Autumn, Winter, and Spring. “The film’s stunning imagery paired with beautiful, elegant music allows us to experience the glory of the Sonoran Desert as it is meant to be and to form our own interpretation of what that experience means to us,” says Craig Ivanyi, executive director of the Arizona-Sonora Desert Museum. Nearly 86 percent of Arizona residents live in the Sonoran Desert, a landscape sweeping from Mexico to California, covering much of southern Arizona, including both Phoenix and Tucson. “Desert Dreams” offers an immersive multimedia experience, revealing the natural treasures that lie beyond urban surroundings. For more information, visit www.wildhorizons.com/desertdreams.